Former President Bill Clinton and his family's foundation went on the offensive today, refuting many details in a Wall Street Journal story that surfaced late Thursday accusing the foundation of enriching his friends. At the 2010 Clinton Global Initiative annual meeting, the initiative announced a $2 million commitment was made by Kim Samuel, which went to support the work of Energy Pioneer Solutions, a for-profit company that designs energy efficiency programs. Energy Pioneer Solutions, however, is in part owned by a close friend of Bill Clinton. ABC News reached out to Samuel and the owners of the company for comment, but calls were not returned. 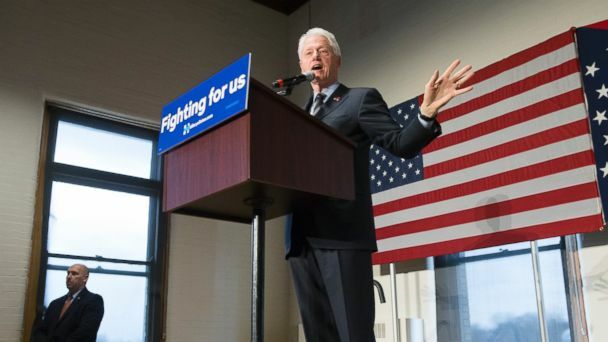 ABC News' Linsey Davis caught up with Clinton as he was campaigning for his wife in Patterson, New Jersey, ahead of the Garden State's primary election on June 7. The former president told Davis that the Wall Street Journal story is "inaccurate." "My foundation has put out the answer to that. It's just not an accurate story," Clinton said. "So, you need to get the facts and then if you have any questions ask." Before Davis could follow up with more questions, staffers pulled the former president away. The Bill, Hillary and Chelsea Clinton Foundation's Chief Communications Officer Craig Minassian said that Clinton is not involved with Energy Pioneer Solutions but that the president has made many friends while in public service. "In fact, many of President Clinton's friends are involved in CGI commitments because they share his belief positive impact [sic] in the world. President Clinton is not involved in the company mentioned," Minassian said. Minassian also insisted that investing in for-profit companies is common as long as they make positive social changes. "Many for-profit companies are addressing climate change and helping reduce dependency on fossil fuels by building solar panels, operating wind farms, and retrofitting buildings to be more energy efficient. Impact and mission-driven investing are major trends in philanthropy," Minassian said. ABC News spoke with John Wonderlich, executive director of the Sunlight Foundation, a nonpartisan, nonprofit organization that aims to make government and politics more transparent. "My quick take is like a lot of things around the Clintons, things quickly get polarized when really it's a pretty complicated issue," Wonderlich said. "The Clinton Foundation by its nature blurs charity, business, politics. ... It's an initiative bigger than our nonprofit laws deal with." Clinton Foundation donations and Clinton Global Initiative commitments are made public by the foundation and the commitment ceremonies are open to the press. According to commitments from the 2010 meeting, the $2 million was pledged to cover the costs of energy-smart retrofits in three Nebraska towns. ABC News reached out to Energy Pioneer Solutions but their registered phone numbers were not working and emails were un-deliverable. Hillary Clinton's presidential campaign did not respond to ABC News' request for comment.